Good morning! Happy Wednesday! 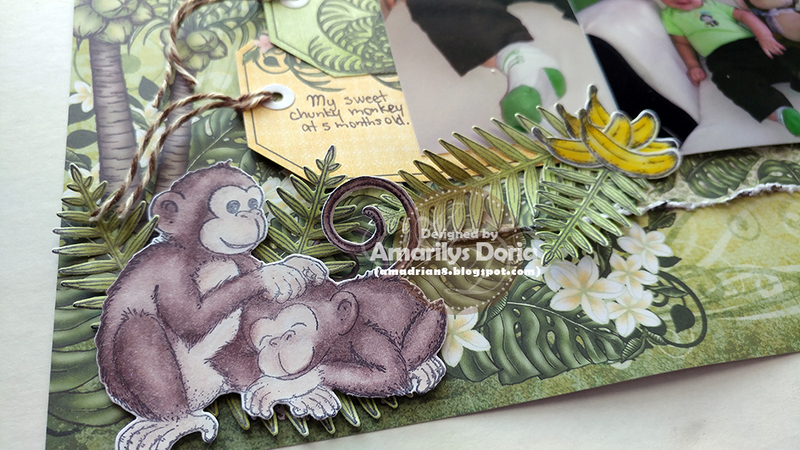 I have a sweet layout of my son when he was little to share with you today using Heartfelt Creations newest collection-Monkeying Around Collection! Cut two 6" x 6" coordinating pattern papers from the Monkeying Around Paper Collection and distress the edges. Add to center of 12" x 12" sheet of paper. Add a 4" x 6" and a 4" x 3" pictures over it and tuck in two pre-printed and die cut (using the Luggage and Tags Die) tags under the left side of the pictures. Stamp the monkeys from the Palm Tree & Monkeys Cling Stamp Set, Monkeying Around Cling Stamp Set and Monkey Antics Cling Stamp Set as well as the leaves in different sizes and bananas on white cardstock. Color the monkeys using Prismacolor Pencils and blend using Odorless Mineral Spirits. Die cut each image using its coordinating die and add to layout as shown. For the larger monkey's face, fussy cut two hands our of white cardstock, lightly color them with the coloring pencils, and add then around the pictures as if he was holding on to them. Finish by adding a die cut title to the top side of your layout. You have created the perfect setting for the adorable photos! The little monkeys just go perfectly on your page! This layout is so-o-o cute! Best photo coordination I've seen in a long time!! So happy to see you back on this Design Team! LOVE your work!